The third issue features a mixture of work from both solo artists and performance groups. The DVD features six video clips (plus an extra special 'Bonus Clip'). The DVD's total running time is about 105 minutes - the longest issue yet. To get a copy of liveartwork DVD issue 3 click on the 'order' link above. Lone Twin produce theatrical events for a variety of locations and contexts. Committed to creating entertaining and hopeful works, performances range from durational pieces to stage and studio presentations. Formed in 1997 by Gregg Whelan and Gary Winters the company have since created an internationally celebrated body of work with regular showings across Europe, North America and Australia. In 2004, KunstenFESTIVALdesArts, Brussels commissioned the 24-day performance To The Dogs. 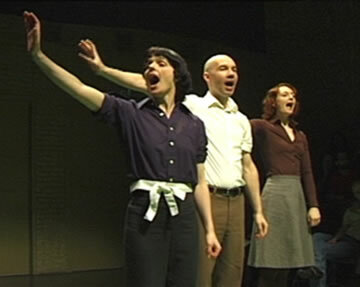 In 2005 the company toured to 18 cities across the world, returning for a second year to Portland Oregon's TBA Festival and presenting four works at The Melbourne International Festival. Alice Bell is Lone Twin Theatre's debut work. Performed by an ensemble of five artists, Alice Bell is the company's first approach on narrative-based theatre. "I grew up in the country. I moved to the city and met a man. I changed my identity to be with this man. Another man discovered this secret and threatened to kill me. I tried to stop him, but he killed me anyway. I leave behind the man I changed my identity for and my daughter Hanna. Good luck the man I changed my identity for, good luck Hanna." Created & performed by: Antoine Fraval, Cynthia Whelan, Molly Haslund, Nina Tecklenburg & Paul Gazzola. Sophiensæle, Berlin; KunstenFESTIVALdesArts, Brussels; Farnham Maltings, Farnham; and Nuffield Theatre, Lancaster. Supported by: The Tron, Glasgow; and The German Federal Cultural Foundation. Mark Wayman was born and grew up in the West Midlands, UK. He studied Architecture, Fine Art and Contemporary Theatre. He has been based in London since 1988. For a time, he was much involved with theatre and collaborative performance work. In recent years he has developed a strand of site-specific performance that employs memory and displacement strategies at its core. These have been performed at locations across the UK and in Europe. Mark Wayman's performances are conceived as guided tours in which inconsequential details form the basis for an intense description of the chosen place. The location may be mundane, but the artist's meticulous monologues reveal its miniature histories, altering our perception of what may previously have seemed familiar. The descriptions do not directly refer to what the audience is looking at. Wayman uses various strategies to detach his words from the scene he is pointing to. He may be looking in the opposite direction from what he describes, he seems to make mistakes, ignores something obvious. This behaviour forces the audience to pay attention, to make their own careful observation of their surroundings. In the gap between our visual perception of reality and Wayman's description of it a strange sense of an infinite number of other possibilities takes hold. 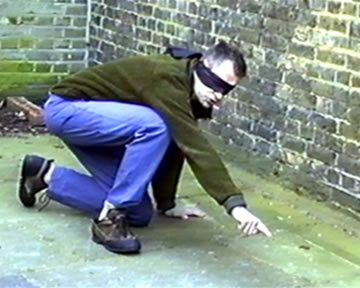 In Shifter the blindfolded performer is led into the rear yard of the South London Gallery and released. He turns around and begins to describe what is there in detail, pointing at each thing as he does so. He follows a circuit around the garden. He does not physically touch anything, so he has no clues as to where he actually is. He relies purely on his memorised map of the space and sense of its scale. The accuracy of his pointing varies between being a few millimetres off target and being out by several metres. The verbal description is at all times consistent with what is there, somewhere. There is a sense of excitement among the spectators, as if they are involved in a game. They are drawn into the verbal description, spotting the things described, waiting for the performer to make mistakes, enjoying them as they occur, wondering if his memory will hold out. Black Market International (BMI) was founded in 1985 with founding members including Boris Nieslony, Tomas Ruller, Norbert Klassen, Zbigniew Warpechowski and Jürgen Fritz. 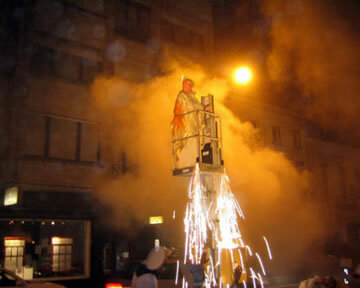 Over 20 years the group has presented its unique, durational performances throughout the world in a range of venues and locations. The group currently consists of twelve regular members. An important element of BMI is that each member has an established and independent practice as a solo performance artist. BMI is not concerned with the formation of group identity but acts as a platform that allows individual performance artists to encounter each other. 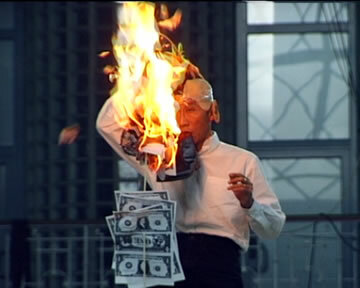 The title 'Black Market' does not designate a group, but rather an idea of working. The performances of BMI are exercises in derision, concentration, sacralisation and effacement. The performer tries to take life seriously while revealing that it is, in fact, worth very little - that it is held in a gesture, that it lasts only a moment. The work of BMI is to create these fundamental moments. BMI is also the art of encounter. There is never a common theme; the work is made according to a principle of open cooperation. Each performance must create a singular time-space complex, exhuming the structure of encounter so that we may regain possession of space and draw the invisible links that constitute it. Norbert Klassen (CH), Helge Meyer (D), Alastair MacLennan (UK), Boris Nieslony (D), Jacques Maria van Poppel (NL), Elvira Santamaria (MEX), Marco Teubner (D), Julie Andree T. (CA), Roi Vaara (FIN), Lee Wenn (SEN), Miriam Laplante (I), Jürgen Fritz (D). Sylvette Babin is an interdisciplinary artist who's primary interest is in performance and installation. Her work reflects upon the recurrent themes of interior exile, everyday events and the transgression of the borders between the self and the other. Using strategies and devices based around the body, absurd settings or situations or visual and sound plays, Babin presents metaphors related to certain physical or psychological states. Babin has participated in many international artistic events in Canada, Argentina, Chile, Poland, Italy, Korea, Ireland, Germany and France. She also works as a writer and critic and is editor of Montreal based arts magazine 'Esse'. She has also been published in various reviews, catalogues and artists' monographs. The Breath series continues a reflection upon spaces of the body and the zones of passage between the interior and exterior, the individual as self and the individual in society as well as the zones of exchanges between Oneself and the Other. In these actions, the principal senses (sight, hearing, smell) are obscured by the artist covering her head with 20kg of tomatoes (Casa rossa); 25kg of grease (Smalec) and soil (Earth). Breathing becomes the principal bond between the artist and the audience. Thus the device connecting the breathing tube with a harmonica transforms each inhalation and exhalation into a variable net of sound according to the rhythm and intensity of the breath. Isolation and endurance are also important elements in these actions where the duration is determined by time it takes the grease to melt under a heat source or the time taken to dig the face from the pile of tomatoes by pressing the juice out of them. Original performances of variable duration. 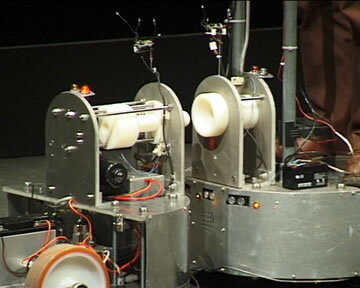 Paul Granjon's work investigates the co-evolution of human and machine. He produces robots and motorised objects for performances, installations and videos. His work is known for being positive, thought-provoking and humorous. Paul Granjon lives in Cardiff, UK. The Heart and the Chip is a performance lecture that begins with a quick overview of Paul Granjon's past work and reflections on human dependency on technology, leading to the artist trying to light a fire using a primitive technique. In the second part he presents an experiment in robotic perception, using a couple of mobile sexed robots. The presentation ends with a song called Romantic Love, interpreted with a heartbeat machine. The DVD also features a special 'Bonus Clip' from Paul Granjon. Harissa is an early work from Paul's Z Productions dating from 1990 and the first of a series of videos featuring inappropriate uses of common foods. Harissa is a very hot, North African chilli paste which is popular in Paul's home town of Marseilles. In 1993 the Harissa video was published on the second issue of 'Grey Suit - Video for Art and Literature' a forerunner of and important influence upon liveartwork DVD. Baktruppen is a group of Norwegians who enjoy making performances together. It started off in 1986 as a theatre project but soon developed into an artistic wonderland where anything can happen. Strange things are constantly taking place. Nothing is too good to be true. Like God, Baktruppen make the world by appearing and disappearing while you watch, because when you look at Baktruppen, God will look back, funny, and there will be no need for explanations. If you come to watch, you will be placed inside somewhere looking out at the streets and then Baktruppen will appear. The video of FunnySorryJesus is a compilation of three performances at different venues in Norway. The performance is staged on the street while the audience are seated inside, viewing through a large window. The performance is Baktruppen's own interpretation of key scenes from the Bible, including the story of Moses, the crucifixion, the last supper and ending with Jesus' ascension into heaven.